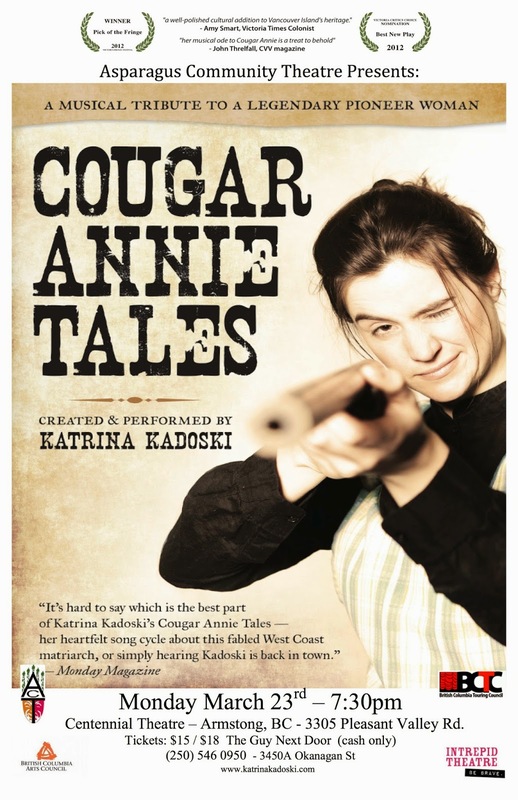 ACT is proud to host "Cougar Annie Tales"
Famed for killing 70 cougars and outliving four husbands in the remote and wind-swept Clayoquot rainforest, the indomitable spirit of west coast pioneer Cougar Annie lives on in Katrina Kadowski’s musical one-woman show. Annie’s stories, letters and photos from her long and fascinating life are interwoven with original songs (on guitar and banjo) by this delightful Vancouver Island performer. This play runs 65 min with a 15 min talkback session following the show. Join us for this special event and help support live theatre in our community!